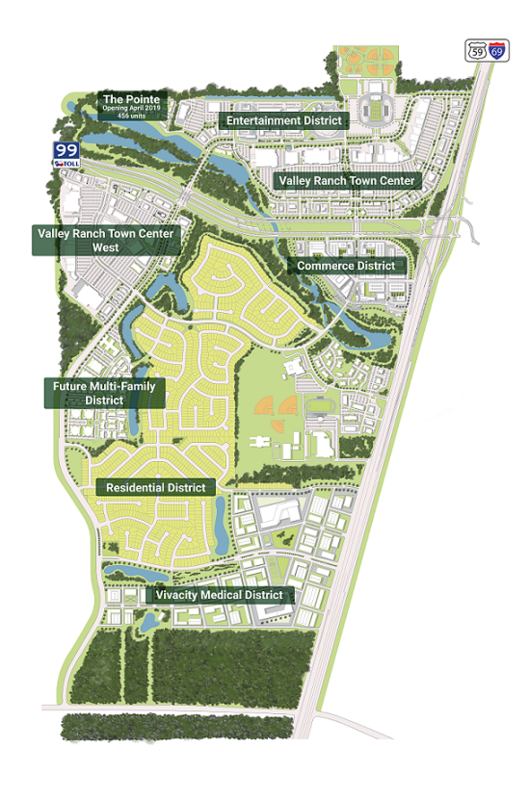 Valley Ranch, a 1,400-acre master planned development that includes all aspects of a modern, connect community. The development is located at the epicenter of growth at the intersection of Interstate 69 (US Highway 59) and The Grand Parkway (99) in Northeast Montgomery County. Strategically positioned just north of Kingwood, 25 minutes from downtown Houston and only 15 minutes to George Bush Intercontinental Airport and The Woodlands. Valley Ranch offers a variety of residential options with shopping, dining, entertainment and work options nearby. The vision of the entire Valley Ranch development is to create the most vibrant mixed-use, master planned community in the Greater Houston Area. Valley Ranch will offer residential, retail, entertainment, office, outlet retail, hotel and medical. Residential: the single-family component of Valley Ranch is fully built out, with the last remaining homes available for move in. Multi-Family: The Villas at Valley Ranch opened in 2008. The Pointe at Valley Ranch Town Center, Houston’s newest luxury apartment community is under construction and will being pre-leasing in March 2019 with an expected opening in April 2019.